1.Department of Neurology, St. Vincent’s University Hospital, Elm Park, Dublin 4, Ireland. 2.Department of Clinical Neurophysiology, St. Vincent’s University Hospital, Elm Park, Dublin 4, Ireland. To describe a case of acute and transient hand weakness that developed during cardiopulmonary resuscitation (CPR) training. Hereditary neuropathy with liability to pressure palsies (HNPP) should be considered in patients with recurrent, painless motor or sensory neuropathies at sites of peripheral nerve compression. Nerve conduction studies confirmed neuropraxia of the distal ulnar nerve with a mild background demyelinating peripheral neuropathy. A positive family history emerged and HNPP was confirmed by genetic testing. HNPP is most reliably diagnosed by molecular testing for peripheral myelin protein 22 (PMP22) gene deletion or point mutation on chromosome 17p11.2. CPR, a procedure carried out by medical professionals on a daily basis, is a high-energy manual task and provides multiple opportunities for nerve compression. This case demonstrates the importance of having a high index of clinical suspicion of this disorder in patients. Recognising a diagnosis of HNPP may prevent unnecessary surgical decompression. Hereditary neuropathy with liability to pressure palsies (HNPP), is an uncommon condition characterised by recurrent episodes of painless, focal motor and sensory peripheral neuropathies, often preceded by nerve compression 1, 2. Despite the rarity of the condition, HNPP should form part of the differential diagnosis in patients presenting with this picture. We present the case of a 50 year-old right-handed lady who developed acute and transient hand weakness during cardiopulmonary resuscitation (CPR) training. On examination of the right hand there was weakness of finger abduction, adduction, palmar grip and pincer grip. She reported no prior injuries to her right upper limb. On specific questioning, the patient recalled past episodes of transient numbness in her hands after performing manual tasks, as well as numbness over the dorsal aspect of her feet after sitting with ankles crossed. Nerve conduction studies five weeks after her initial presentation revealed a distal right ulnar motor neuropraxia with a background mild demyelinating peripheral neuropathy (Figure 1A). A positive family history emerged and HNPP was subsequently confirmed by genetic testing for deletion of the peripheral myelin protein-22 (PMP22) gene on chromosome 17. There was some transient difficulty performing dextrous tasks at her work as a dental hygienist but this had normalised after three months. 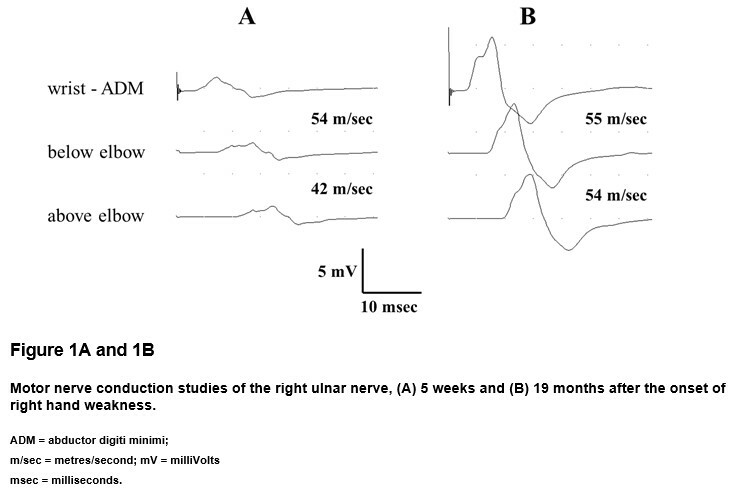 The ulnar neuropathy had resolved on repeat nerve conduction studies 27 weeks after the onset (Figure 1B). HNPP, also known as ‘potato-grubbing disease’ and ‘tulip-bulb diggers palsy’, was first described in 1947 by De Jong, a Dutch neuropsychiatrist 3. The prevalence of the condition is estimated to be up to 16 per 100,000 1. The condition is characterised by repeated focal pressure neuropathies affecting the limbs, such as peroneal palsy with foot drop, ulnar neuropathy and carpal tunnel syndrome. A positive family history may be evident. On examination there can be evidence of previous mononeuropathies, such as focal weakness or sensory loss. Signs of a mild peripheral neuropathy and mild pes cavus may also be found 2. The characteristic findings of HNPP on nerve conduction studies (NCS) include motor and sensory slowing at nerve entrapment sites, such as the ulnar nerve at the elbow and the median nerve at the carpal tunnel. Nerve biopsy reveals demyelination and focal sausage-shaped swellings (tomacula) of the myelin sheath 4. The condition is inherited in an autosomal dominant manner and is associated with mutations of the PMP22 gene. While the exact function of PMP22 remains unknown, animal studies have demonstrated its role in the development and maintenance of myelin junctions in peripheral Schwann cells 2, 5. The mononeuropathies of HNPP are more likely to occur with certain occupations. Many medical professionals need to perform CPR regularly, both in hospital and community settings. The procedure requires prolonged hyperextension of the wrists and locking of the elbows, often for prolonged periods of time. The mainstay of treatment for HNPP is symptom alleviation through conservative splinting and activity modification. The role of surgical nerve decompression in inherited neuropathies remains a topic of debate. While Carpal Tunnel decompression surgery is found to effectively reduce symptom severity in patients with Charcot Marie Tooth Disease Type 1a (CMT1a), it is not found to be effective in patients with HNPP 6. Complete recovery is seen in approximately 50% of episodes and the [delete-remaining] symptoms that remain are rarely severe 4. This case demonstrates the importance of having a high index of clinical suspicion for HNPP where recurrent mononeuropathies are found, especially when the patient’s occupation causes repetitive physical pressure on peripheral nerves and where there is a positive family history. A diagnosis of HNPP may prevent unnecessary surgical decompression. 1. Bird TD. Hereditary neuropathy with liability to pressure palsies. GeneReviews. 2014. 2. van Paassen BW, van der Kooi AJ, van Spaendonck-Zwarts KY, Verhamme C, Baas F, de Visser M. PMP22 related neuropathies: charcot-marie-tooth disease type 1A and hereditary neuropathy with liability to pressure palsies. Orphanet J Rare Dis. 2014;9:38. 3. Koehler PJ. Hereditary neuropathy with liability to pressure palsies: the first publication (1947). Neurol. 2003;60(7):1211-3. 4. Li J, Krajewski K, Shy ME, Lewis RA. Hereditary neuropathy with liability to pressure palsy: the electrophysiology fits the name. Neurol. 2002;58(12):1769-73. 5. Guo J, Wang L, Zhang Y, Wu J, Arpag S, Hu B, Imhof BA, Tian X, Carter BD, Suter U, Li J. Abnormal junctions and permeability of myelin in PMP22-deficient nerves. Annals of neurology. 2014;75(2):255-65. 6. Panosyan FB, Kirk CA, Marking D, Reilly MM, Scherer SS, Shy ME, Herrmann DN. Carpal tunnel syndrome in inherited neuropathies: a retrospective survey. Muscle & nerve. 2017.